We all know what Neanderthals looked like: the beetling brow ridges, thick nose, long skull, massive bone structure – and probably red hair and freckled skin. You might do a double-take if you saw one on the subway, wearing a suit, or you might not. But you would surely look twice at the hunter-gatherers that populated Europe between 7,000 and 8,000 years ago, whose DNA scientists are analysing now. They had dark skin and, very likely, bright-blue eyes. This combination essentially vanished from ancient Europe, replaced by light-skinned, brown-eyed farmers who moved in from the Middle East over the course of several centuries, and who looked like most of the population of southern Europe today. These early farmers, who depended on milk, have the gene for lactose tolerance that is missing in the old hunter-gatherer population. They ate much less meat and far more starch than the original meat-eating Europeans, and depended both on milk and on sunlight for vitamin D – hence their lighter skin. As for the dark, blue-eyed people, they disappeared from Europe, swamped genetically by the invaders over time. This is a tale of fast human evolution. New ways of living – farming crops, and herding animals rather than hunting – led to the rapid expansion of genes that took advantage of these cultural adaptations. The ancestral dark skin, probably inherited from our common forebears in Africa, could have been a disadvantage if most calories came from cultivated grains rather than meat from wild animals, rich in vitamin D. Blue eyes remained, though the form of the gene (called an allele) for blue eye colour is recessive, and easily swamped by alleles for brown eyes. So within some span of time – we can’t say exactly how long – ancient Europeans began to look quite different. There was also an influx of genes from east Asia, from peoples likely resembling the modern Chukchi and other native Siberian groups closely related to Native Americans. Ancient Europe was a melting pot, but certain alleles, for light skin and brown eyes, became dominant as the hunter-gatherer way of life receded against an influx of farmers and farming. We think of evolution, described by Charles Darwin in 1859, as a slow dance: nature chooses the best-adapted organisms to reproduce, multiply and survive in any given ecosystem. As organisms adapt to changing ecological circumstances over millennia, the varieties best-suited to the environment thrive, allowing species to emerge and evolve. This is the process known as natural selection, or differential reproduction, which simply means that the organisms best-adapted to their particular, immediate circumstances will pass on more genes to the next generation than their less-well-adapted conspecifics (members of the same species). Permanent change, of the kind we see in the fossil record, takes more time. Just look at the plodding trajectory of the several-hoofed Hyracotherium, a dog-sized forest-dwelling mammal that gradually lost its side toes (four on the front legs and three on the back) as the central one enlarged. It took 55 million years for it to evolve into the large, single-hoofed, grass-feeding horse we know today. But sometimes evolution happens fast. As the biologists Peter and Rosemary Grant at Princeton University in New Jersey showed in their studies of Galapagos finches, small beaks can change into large beaks in a single generation, depending on climate conditions and the type of food to be found on those harsh islands. The small-beaked birds might die out, while the large-beaked prevail, for a while at least. But those rapid changes aren’t often permanent. Though the Grants might have witnessed the evolution of an entirely new, heavy-bodied finch species, many of the changes they saw in finches’ beaks were reversed, again and again. Changes in vegetation could mean that large beaks become a handicap. This shifting process – small changes over short periods of time – is called ‘microevolution’. The evolutionary biologists David Lahti of Queens College at the City University of New York and Paul W Ewald of the University of Louisville both argue that there’s nothing exceptional about fast evolution. Rapid change, transient or lasting, simply reflects the intensity of selection, the strong action of Darwin’s ‘hostile forces of nature’, including predation, heat, cold, parasites. Difficult times could mean extinction for some species, or fast evolution for others. But to enable fast evolution, you must have enough genetic variation present in the underlying gene pool for selection to work upon. Hence the swift replacement of the hunter-gatherer with the farmer in ancient Europe. Light-skin genes overtook dark-skin genes because, likely, those genes better fit both the European environment and a new way of life. Lahti adds that for human populations social selection becomes paramount: the presence of other hostile groups and the human ability for in-group cooperation drove the emergence of human social complexity and the evolution of the human brain. We don’t know whether the contact between European hunters and Middle Eastern farmers (or the East Asian people who also contributed their genes to the European pot) were friendly or hostile. Likely, in ancient Europe, there were skirmishes; likely, also, there were peaceful exchanges. We can’t know: all we see is the result, the apparent swamping of one set of traits for others that gradually became fixed in the area. Of course, blond hair and light skin came to characterise Europe in the far north, among the ancestral Scandinavian population; pale skin here is likely an adaptation to vitamin D shortage. Dark skin remains a useful adaptation in hot, sunny climates. As climate changes, perhaps local variations in human appearance will be favoured in ways we don’t yet know. 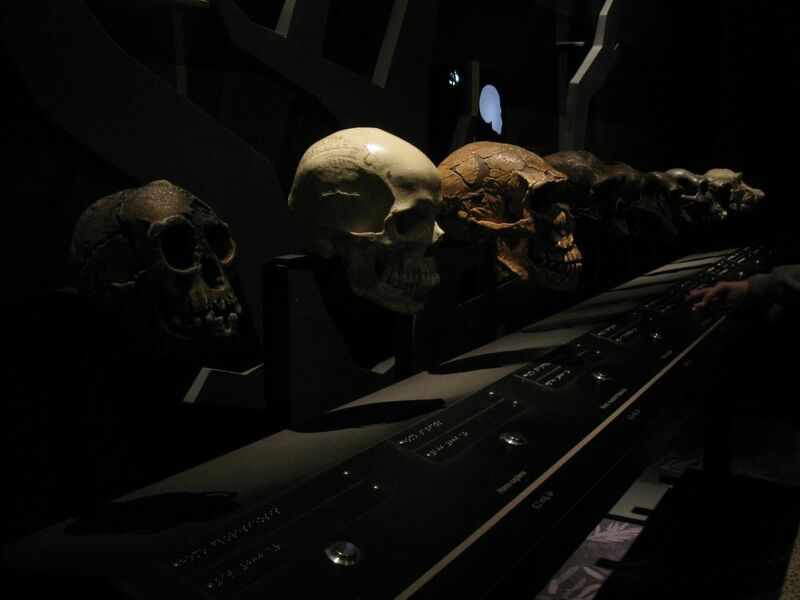 Human evolution and the forces that produce it have never stopped. Some people will always be favoured genetically, and their offspring will be more likely to survive. That’s the essence of natural selection. And so adaptation and human evolution go on all the time. As a species, it’s impossible to say that we’re evolving in a particular direction – towards bigger heads and spindly limbs, say, as science fiction often suggests. But on the local level, adaptation and natural selection are always at work, adapting us to combat whatever threats – new diseases, climate change, new social selection processes – are now, often invisibly, at hand. If We Survive Another Billion Years, What Will Life Be Like?